Join Jyn Erso on her mission to steal the Death Star Plans in an all-new graphic novel from IDW Publishing! 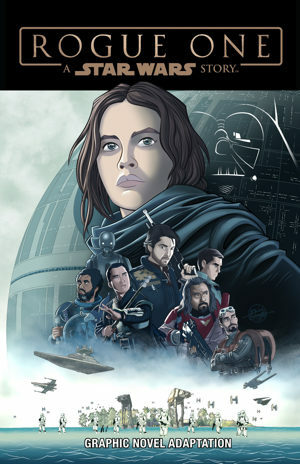 San Diego, CA (January 3, 2018) – IDW Publishing continues to expand its Star Wars graphic novel line with another beautifully realized Star Wars adaptation as Star Wars: Rogue One Graphic Novel Adaptation has officially arrived. Fans of the Star Wars blockbuster can re-live the adventure in a new art style appealing to fans of Disney’s animation. The mission to steal the Death Star plans has never looked so good! Return to the adventure with the ragtag crew of Jyn, Cassian, K-2SO, Chirrut, and Baze in a galaxy far, far away. See the sands of Scarif, Vader’s castle on Mustafar, or even the kyber rich desert moon of Jedha as you flip through this 80-page book. Star Wars: Rogue One Graphic Novel Adaptation features the creative talent of Star Wars veterans, including author Alessandro Ferrari (Star Wars Saga graphic novel adaptations, Star Wars: The Force Awakens), along with illustrators and artists Andrew Parisi, Igor Chimisso (Star Wars Saga), Matteo Piana (Star Wars Saga, The Ring of the Seven Worlds), and a brand-new cover by artist Eric Jones (Tron: Ghost in the Machine, Star Wars Adventures). The Star Wars: Rogue One Graphic Novel Adaptation trade paperback collection is available for $9.99 in comic shops and book stores everywhere. The time to fight is now!